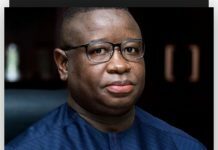 Sierra Leone’s Association of Journalists (SLAJ) has expelled the publisher of Awareness Times Newspaper Sylvia Blyden. At a general meeting yesterday, SLAJ president Umaru Fofanah put the motion forward on the basis that Blyden constantly “ridicules” the association in her paper while continuing to retain membership. 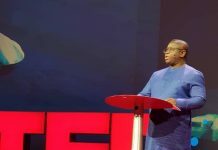 Fofonah is the BBC correspondent in Sierra Leone and he’s also a contributing writer to the Focus in Africa Magazine. 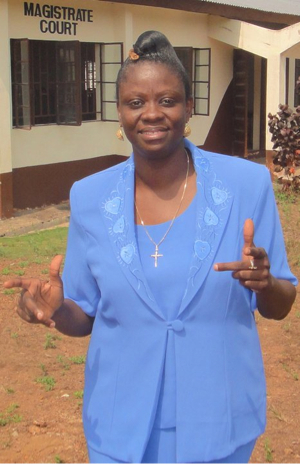 Sylvia Blyden has a medical degree from the College of Medicine at the University of Sierra Leone. 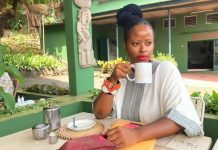 Most people first heard of her via an internet cafe she operated at the Lumbley roundabout in Freetown. She started publishing her news paper Awareness Times sometime in 2005. Her expulsion comes days after Kelvin Lewis, Editor of Awoko and Chairman of the Guild of Newspaper Editors wrote an open letter to the President of Sierra Leone asking that he take action against her for “scathing attacks on the Independent Media Commission (IMC), the Sierra Leone Association of Journalists (SLAJ), and lately the Guild of Newspaper Editors (GNE) along with denigrating remarks on the persons of all the individuals leading these institutions”. 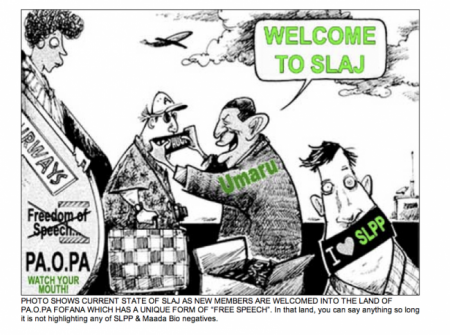 In response to her expulsion from SLAJ, Blyden today published a cartoon in the online edition of her paper hinting that Umaru Fofanah is pro the opposition SLPP and Maada Bio. She also argues that only 17 of 600 SLAJ members were present at her expulsion and that those who weren’t there did so partly to “boycott” the vote. Blyden and her publication empathized with the SLPP for many years. But her tone changed dramatically with the nomination of Maada Bio as the SLPP presidential candidate. Since then she has given many pages in her paper to discredit Bio and the SLPP while attacking anyone who questions her change of tune. I have lost a lot of respect for this Woman,her reporting is very subjective. I wonder what SLPP did to her to make her so bitter. I definitely will not be surprised if she gets a government post if APC wins.